Band saws can be intimidating. They’re loud, powerful, and hard to handle. Not to mention, they can cost quite a lot of money. However, if you’re a DIY-er or a professional woodworker, you’re going to have to get used to working with a band saw. That’s to say if you ever want to finish that DIY project or excel at carpentry. And honestly, band saws aren’t really that scary. You just need to find a good, reliable product; one that won’t malfunction, breakdown, or destroy all your hard work. That’s why we’ve come up with a list of the best band saws of 2019. If you need a good band saw that can cleanly cut both curves and edges, then you’re reading the right article. We’ve developed in-depth reviews for the 10 top-selling band saws currently on the market. Also, we’ve included a comparison table and a handy buyer’s guide to help you during your band saw shopping. Go ahead and take a look at what we’ve found. First up, we’ve composed a helpful comparison table of our top rated band saws. We’ve compared each option based on a number of different features that will help you with your woodworking needs. Rather you’re looking to buy either a portable or bench top, you’re guaranteed to find what you need in this article. So, why don’t you take a look at our comparison table of the top 10 best value band saws of 2019? As you can see we compared our top choices based on a few different categories. First off was dimension and weight. We choice these categories because they provided an idea of how heavy, large, or small the band saw were. This is important for those individuals needing a smaller portable band saw rather than a bench top band saw. We also compared them based on product warranty and additional accessories. This was to determine everything that was included with the purchase. Unfortunately, for this article, we decided to leave out both the Grizzly G0513X2 and Powermatic Model PWBS-14CS Deluxe. Of course, these two band saws are extremely popular as powerful, professional quality products. The Grizzly G0513X2 features 17-inch frame and 2 HP motor. Meanwhile, the Powermatic Model PWBS-14CS Deluxe comes with a 5-year warranty and a heavy-duty vibration-free iron frame. Both are rated very highly by both professional and casual woodworkers. However, there are a few reasons why we decided to leave them off our list. Both the Grizzly G0513X2 and the Powermatic Model PWBS-14CS Deluxe cost significantly more than what we were looking for in an affordable band saw. The Grizzly G0513X2, alone, costs over two-thousand dollars. We were hoping to keep it a minimum of one-thousand dollars with the one exception; that being the Laguna Tools MBAND1412-175. Both power tools feature an advanced, complicated system that’s meant more for expert woodworkers. Our goal was to find band saws for new and novice carpenters, DIY-ers, and small store professionals. The Grizzly G0555LX Deluxe Band Saw features a handy aluminum T-shaped design. It has a cast iron frame and a heavy, industrial-quality stand which guarantees long-use without tear or breakdown. CSA certified, it excels and matches all CSA and UL standards. It also comes equipped with computer balanced cast iron wheels and rubber tires. This allows the band saw to be maneuvered more easily. Meanwhile, its heavy frame prevents the tool from shaking or falling during use. Equipped with a 1 HP motor, it’s pre-wired for 110 volts, but it’s also compatible with 220 volts. The Grizzly G0555LX Deluxe Band Saw comes with an aluminum resaw fence. Its fence is adjustable and comes with a magnifying window and a miter gauge. The table size is 14 by 14 inches with a 1 ½ inch thickness. Blade speed is typically 1800 to 3100 FPM. Overall, this product is extremely easy to use and it’s an affordable option for anyone needing a band saw for a small project. What the Grizzly G0555LX Deluxe Band Saw lacks is power. Its 1 HP motor is helpful for smaller, at-home projects, but it’s not the best option for commercial use. Also, because this band saw is so heavy, it’s very hard to maneuver. The Grizzly G0555LX Deluxe Band Saw is a great option for curved, odd, or irregular shaped cutting. Unfortunately, it does not come with a product warranty or money back guarantee. However, its heavy-duty design promises long-use with minimal need for regular maintenance. The Grizzly G0555LX Deluxe is the perfect band saw for new or inexperienced woodworkers. Affordable and easy to handle, it’s a band saw that’s worth every penny. The Rikon 10-305 Band Saw utilizes solid steel for a sturdy, heavy-duty design. Equipped with a 1/3 HP motor, this band saw for high speed cutting with exceptional results. It’s capable of cutting up to 2780 feet per minute, making it a great option for soft wood cutting. It comes with a removable rip fence for better results. This band saw also comes with a 13 ¾ by 12 ½ inch table for holding large pieces of wood. It comes equipped with a handy safety paddle switch for quick and immediate shut-downs mid-use. The Rikon 10-305 Band Saw comes with a Micro Adjustable Guide Post. This guide post can be raised or lowered with a simple turn of a handle. 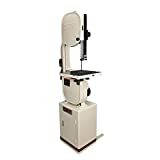 Its cutting capacities include a max height of 4 5/8 inches, with a 9 5/8 inch width limit. It can hold blades as small as 1/8 inches and as a large as ½ inches. Finally, this band saw is considerably less expensive than many other products on our list. It’s definitely a band saw that’s worth its price. The Rikon 10-305 Band Saw isn’t very powerful. With its 1/3 HP motor, it’s not built for speedy cutting or commercial use. It’s also a bit difficult setting the blades. The instruction manual doesn’t do a good enough job in explaining how to set the blades. Finally, the detachable fence is a nice addition, but it can be a potential safety hazard if it’s not fully attached. The Rikon 10-305 Band Saw has everything you could possibly need as a professional or new woodworker. It also comes with a 5-year warranty that protects against product defects in materials and workmanship. 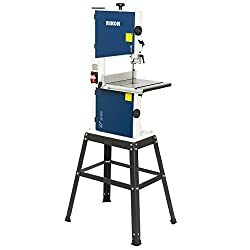 If you’re looking for a good deal, then you’ve definitely found it in the Rikon 10-305 Band Saw. While it might not be the most powerful band saw on our list, the Rikon 10-305 is a tool that does its job well. You won’t be disappointed with the Rikon band saw. Next on our list is another Rikon product. The Rikon 10-325 Deluxe Band Saw features a 1 ½ HP motor and its pre-wired to handle both 110 and 220 volts. Equipped with precision-balanced, cast iron wheels, it boasts a sturdy, yet portable design. This benchtop band saw comes with an impressive dual-speed feature. It allows you to cut with lower speeds of up to 1,445 feet per minute, as well as, with faster speeds of up to 2,950 feet per minute. The lower speed option is best for cutting hard woods and plastics, while the faster speed option is best for all other types of cutting. The Rikon 10-325 Deluxe Band Saw comes with an impressively durable rip fence and a resaw bar. It features a cast table trunnion for tilting and locking the table at an angle. This band saw also comes with a helpful storage cabinet for storing blades and other tools. Its blade quick release feature allows for quick and simple blade switches. It also comes with a built-in light for better vision during use. The Rikon 10-325 Deluxe Band Saw offers an impressive amount of additional features and accessories. The downside to the Rikon 10-325 Deluxe Band Saw is that it’s pretty expensive. While it might not be the most expensive product on our list, it’s definitely not the cheapest. It’s also a bit difficult to assemble. Make sure that you use the user manual when assembling this band saw. Along with all the additional features and accessories, the Rikon 10-325 Deluxe Band Saw also comes with a 2-year warranty. This warranty protects against product defects in materials and workmanship. What’s even better is that this band saw is available both in-store and online. Many everyday stores, like Sears or Target, may have them in stock. Not only that, but 3rd party retailers may offer their own money back guarantees and refunds. I recommend that you enquire about this before purchasing from a 3rd party retailer. Without a doubt, the Rikon 10-325 Deluxe Band Saw is one of our top favorite picks. While it’s too expensive to be considered a good choice for a new or novice woodworker, it makes a great alternative for a professional. The JET JWBS-14DXPRO Deluxe Pro Band Saw Kit features a 1 HP motor for quick uses and faster cutting speeds. It comes with a variable speed option for cutting up to 1,500 SFPM, as well as, 3,000 SFPM. This band saw is pre-wired to handle both 115 and 230 volts. It features a 2-speed poly-v belt drive system for convenience and variety. It’s also designed with a handy blade tracking window for ensuring the best results. The JET JWBS-14DXPRO Deluxe Pro Band Saw features an extremely durable cast iron frame. It has a Quick-release blade tension feature for convenience and for extending your blade life. Its cutting capacity height is set at 12 inches, while its max width is 13 ½ inches. It also comes with a built-in retractable blade guard. This provides the ability to work at heights that range from 0 to 12 inches. It’s an extremely handy feature because it allows you to work on both small and large projects. Unfortunately, the JET JWBS-14DXPRO Deluxe Pro costs quite a lot of money. Costing almost one thousand dollars, it’s one of the most expensive band saws on our list. Besides the price, there’s really not much to say in terms of negative traits. It doesn’t come with a rip fence, so you should be aware of this flaw if you decide to purchase this band saw. The JET JWBS-14DXPRO Deluxe Pro Band Saw is considered one of our more expensive choices. However, it’s still one of the best band saws currently on the market. It also comes with an impressive 5-year warranty that protects against product defects in materials and workmanship. This band saw is the perfect option for an experienced, professional woodworker who’s looking for a sturdy, long-lasting product. If you have the money and you’re a professional woodworker, I would suggest purchasing the JET JWBS-14DXPRO Deluxe Pro Band Saw. It performs perfectly with amazingly accurate results. The SKIL 3386-01 is a miniature, 3 ½ band saw for small, light cutting. It’s also the cheapest band saw on our list. This product is the perfect option for anyone looking to complete a small DIY project or something similar. Its throat capacity is a total of 9 inches, while its table is 12 by 11 ½ inches. With a 2.5 amp motor, its SFPM rate is 2,800. It features EZ View Blade Tracking for quick and simple blade alignment. This band saw also comes with a rack and pinion adjustable table for easy height and angle adjustments. The SKIL 3386-01 Band Saw comes with a miter gauge for cross cuts, as well as, a rip fence for making straight cuts. It comes with a built-in LED light for better vision, as well as, a handy dust port for preventing dust build up. At 36 pounds, this product is the most portable band saw on our list. This means that it’s great for maneuvering from location to location. It also comes with a blade guide adjustment feature for changing the depth of the blade for convenience. It’s pretty obvious what the SKIL 3386-01 Band Saw’s major flaws are. First, its small size and lack of power mean that it would not be a great option for large projects or professional use. Secondly, while its lightweight design allows it to be portable, it does nothing in terms of durability or stability in use. Because it’s so lightweight, it might shake or fall while you’re using it. So make sure that you securely latch it down to a sturdy table before using it. Despite its small size and lack of power, the SKIL 3386-01 Band Saw really out does itself in terms of convenience. It’s a power tool that even a first-time woodworker could easily master. It also comes with a limited 3-year warranty that protects against product defects in materials and workmanship. 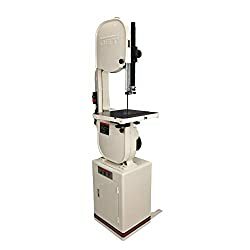 Make sure that you sign up for the warranty within the first 30 days after purchasing this band saw. There’s really no better option for a portable band saw. If we were comparing this product based on professional use, then it would not have scored well. 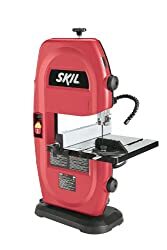 However, for DIY or the occasional user, the SKIL 3386-01 is the best band saw you can get. Next up on our list is the POWERTEC BS900 Band Saw. It’s just another tiny, portable band saw that packs a powerful punch. This product comes with a ½ HP and 2.5 amp motor. 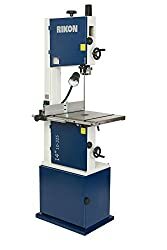 It’s an extremely inexpensive bench top band saw that’s smaller than most of our other choices. This product comes with a patented blade guard adjustment feature for simple and speedy blade changes. Its blade tracking window allows you to keep a close eye on your cutting with little hassle. The POWERTEC BS900 Band Saw comes equipped with a rack and pinion adjustable table for easy height and angle adjustments. It also features a quick release blade tension lever which guarantees fast and simple blade changes. Its handy dust port is 2 inches wide and is great for preventing dust buildup. At 90 degrees, its max cutting depth is 3 5/8 inches, while at 45 degrees its max depth is 2 inches. Capable of performing up to 1725 RPM, it’s no wonder why we chose this band saw for our list. At 43 pounds, the POWERTEC BS900 band saw is a bit lightweight and less durable than many other products on our list. It has the tendency to wiggle while in use, so you may want to latch it down to a sturdy table before using it. Also, it’s not designed for large, professional projects. I would stick to smaller, lighter woodworking. The POWERTEC BS900 Band Saw is a great choice for any occasional carpenter or woodworker. It’s guaranteed to provide great results when used on small or light projects. Not only that, but it’s the 2nd cheapest band saw on our list. It also comes with a 30-day money back guarantee and a 1-year limited warranty. This warranty protects against product defects in materials and workmanship. So, if the SKIL 3386-01 didn’t seem right for you, I would definitely give the POWERTEC BS900 a closer look. We really liked the POWERTEC BS900 band saw. It makes a great alternative for an occasional user or DIY-er who doesn’t want to spend a lot of money but still wants a reliable product. The Shop Fox W1706 14" Band Saw comes with a 1 HP, 14 amp motor that’s capable of performing up to 1,725 RPM. It’s equipped with cast iron wheels and is pre-wired to hand 110 and 220 volts. It features a 4-inch dust port for preventing dust and wood chip buildup. This band saw also comes with a deluxe aluminum extended fence for super long straight cuts. It comes with a quick change blade release/tensioning for super speedy blade changes. The Shop Fox W1706 14" Band Saw max cutting height is 6 inches. It also comes with a dual speed feature for cutting a max of 1,500 FPM and 3,200 FPM. This band saw utilizes a standing cabinet for tool and material storage. It also comes with a complimentary 3/8 inch blade, rip fence, and miter gauge for cross cuts. You’re given the option of purchasing an installable extension block. This increases the resaw capability from 6 inches to 12 inches. It also comes with hinged wheel covers for further convenience and stability during use. It’s important to be aware that the Shop Fox W1706 14" Band Saw is a fairly expensive product. Costing close to one thousand dollars, it’s one of the more expensive band saws on our list. Also, the bearing guides under the band saw are a bit difficult to reach. The Shop Fox W1706 14" Band Saw is an extremely durable, long-lasting band saw that will provide years of use. It also comes with a 2-year warranty that protects against product defects in materials and workmanship. 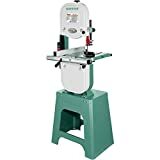 Because it is a fairly expensive band saw, I wouldn’t recommend this product for an occasional woodworker or carpenter. However, for learning or professional woodworking, this band saw makes the perfect investment. The Shop Fox W1706 14" Band Saw is an extremely impressive product. While a bit on the pricey side, it provides great results and comes with a wide variety of attachments. The Grizzly G0555 the Ultimate Band Saw comes with a 1 HP, 5.5 amp motor for optimal performance. It features a super durable cast iron frame, and at 195 pounds, its heavy design keeps it solidly planted on the ground during use. This band saw comes equipped with cast iron wheels with rubber tires. It also comes with a handy fence for straight cuts, as well as, a magnifying window for keeping a close eye on your projects. The Grizzly G0555 the Ultimate Band Saw comes with both a miter gauge, as well as, a Quick-release blade tension lever. Its Quick-release blade tension lever is perfect for quick and simple blade changes with little hassle. This band saw also features an adjustable blade speed option for both slow and quick cutting. At lower speeds, you can cut up to 1500 FPM, while higher speeds have a max of 3200 FPM. This product also comes with a 4-inch dust port for preventing dust and wood chip buildup. The manufacturer’s customer service could definitely be improved. Also, assembling the Grizzly G0555 the Ultimate Band Saw can be a fairly difficult process. You might need an extra hand to help you put this band saw together. Finally, you should be aware that the blades guides aren’t fine enough. If you knock them a little, it’ll make a huge difference. The Grizzly G0555 the Ultimate Band Saw boasts a user-friendly design that’s perfect for novice woodworkers and DIY-ers. While it’s not an extremely inexpensive option, it’s not horribly expensive either. Unfortunately, this band saw also doesn’t come with a product warranty or money back guarantee. However, it may be available in-store, as well as, online. If you purchase it via a 3rd party vendor, you may be able to apply for a warranty or product protection through the vendor. The Grizzly G0555 the Ultimate Band Saw works as well as expected. While it’s not overly expensive, it’s not the cheapest either. It makes a great option for a casual or regular carpenter or DIY-er. Ok, so the Laguna Tools MBAND14​​12-175 is the most expensive band saw on our list. As expected, it performs at professional-quality levels for perfect, smooth results with every use. CSA certified, this tool is safe to use on all most any type of wood or plastic. It comes with an extremely powerful 1 ¾ HP motor and it’s pre-wired to handle both 115 and 230 volts. This band saw features a steel frame design with cast iron wheels that are electronically controlled and balanced. It also comes with a cast iron trunion for tilting and angling the table. The Laguna Tools MBAND1412-175 comes with an impressive 18-inch aluminum rip fence for straight, precise cuts. Equipped with a Quick release blade tensioner, it guarantees quick and speedy blade changes. Its 4-inch dust port prevents dust and wood chip buildup by forcing dust away from the blade and into the port. This band saw also is equipped with double windows for regularly checking the tension and tracking while the machines running. Unfortunately, the Laguna Tools MBAND1412-175 band saw costs more than one thousand dollars. This makes it the most expensive band saw on our list. Also, the rip fence is a bit flimsy and the lower guide is located in a very unfortunate location. You may be crawling around a bit on the ground every time you adjust the knobs. For a thousand dollar band saw, this is a bit irritating. 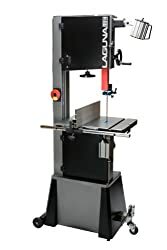 The Laguna Tools MBAND1412-175 band saw is a great product that has received nothing but good reviews by past customers. Guaranteed to last years, this band saw is powerful, versatile, and extremely durable. Not only that, but it’s also easy to handle. While the Laguna Tools MBAND1412-175 doesn’t come with a warranty, its sturdy design requires little to no additional maintenance. Overall, we were very impressed with the Laguna Tools MBAND1412-175 band saw. We have no doubt that this band saw would make the perfect option for a professional carpenter. 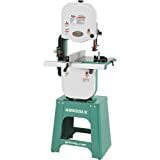 The Rockwell RK7453 Shop Series Band Saw is a small, compact, and lightweight product that’s great for DIY-ers or novice woodworkers. It comes with a reinforced aluminum table that features a bevel angle between 0 and 45 degrees. This band saw comes with an extremely handy built-in flex-adjust work light which provides optimal light for whatever angle. Its blade quick tension adjustment features guarantees quick and simple blade changes and adjustments. It also comes with a blade guide adjustment feature for altering the cutting depth. The Rockwell RK7453 Shop Series Band Saw comes equipped with a 2.5 amp motor for continuous performance. Pre-wired to handle 120 volts, it’s a great option for any small or casual project. Its max cutting depth is set at 3 1/8 inches, while its throat depth is 9 inches. It comes with a parallel guide, a miter gauge, as well as, a hex key. The table, itself, is a full 11 13/16 inches square. Overall, the Rockwell RK7453 Shop Series Band Saw is a cheap and promising band saw that deserves a closer look. The first problem with the Rockwell RK7453 Shop Series Band Saw is that it’s not very powerful. With a 2.5 amp motor, it’s best used on small projects and not large, professional ones. While this band saw comes with a stand, it sometimes shakes or wobbles during use. You should be sure to securely latch it down before using it. The Rockwell RK7453 Shop Series Band Saw comes with a helpful 2-year warranty. This warranty protects against product defects in materials and workmanship. 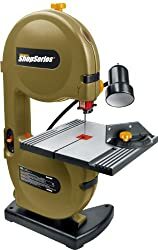 It’s easily one of the cheapest band saws on our list for a novice or casual woodworker. Despite its low price, it provides high-quality results with every use. Honestly, we felt that the Rockwell RK7453 Shop Series Band Saw could have performed a bit better. That said, it really does make a great alternative for anyone looking for a cheap, affordable band saw for a small project. For some reason, band saws are a typically underappreciated power tool most often used for carpentry. Simply put, band saws are an electric powered power tool that uses a serrated blade to cut stock to size. The blade is pulled between 2 pulleys in a loop-like fashion. Typically, the lower pulley is driven by an electric motor while the upper pulley is idle. They can be used to cut curves, thick lumber, and cross sections into wood, plastic, and even metals. There are 3 types of band saws: bench-top, stand mounted, and floor standing. Bench-top band saws: These are typically smaller, more compact, and less powerful than other band saws. They’re portable and best for DIY projects or at-home work. They can also cost less than other standing models. Stand mounted band saws: These can be a lot heavy and more expensive. Stand mounted band saws come with their own cast iron stands that are typically converted to use as cabinets or storage areas. They can with an open frame. Floor Standing band saws: These are typically powerful with large motors and large frames. They are best for professional use. However, they can be fairly expensive. What to Consider When Buying a Stand Band Saw? When choosing a band saw, you’ll want to consider if it’ll need to be portable or stationary. This can determine if you need a bench-top, a floor standing, or a stand mounted band saw. Of course, wheels are a great option for a portable band saw. If you decide to choose a band saw with wheels, I recommend one that comes with 2 to 3 wheels. This provides stability and mobility at the same time. When talking about band saws, size can mean either the weight or the dimension of the band saw. Why don’t I go over why each of these factors is important? Weight: Band saws can vary based on weight and height. Of course, individuals who need a portable band saw should stick to items that are less than 50 pounds. However, when you drift lower than 30 pounds, you may find that your band saw is too light. A light weight band saw may be a bit less stable or sturdy during use. This can easily cause accidents or mistakes. So, it’s always important that you pay attention to the band saws weight. Dimensions: of course dimension is an incredibly important factor to consider when choosing a band size. This is dimensions refer to the length of the table, the blades, and every other piece of equipment you’ll need to use. It determines rater or not you can do small or large projects. One such dimension you’ll want to consider is the saw’s cutting depth. This is determined based on the distance from the blade guard to the table. It will tell you the amount of clearance the guide needs for smooth even cuts with full mobility. It’s important to note that motor sizes can range from 1/3 HP (horsepower) to 2 HP. Smaller motors are best for thin stocks, while larger motors are perfect for re-sawing work. Trunnions: Trunnions, or semi-circular brackets, allow the table to tilt for better angles and positions. They typically provide up to a 45-degree tilt. Dust Port: These prevent the buildup of dust in or around the band saw. Rip Fence: This is a metal bar that runs parallel to the band saw’s blade. It’s used for straight, precise cutting. Miter Gauge: These are used for holding the table at specific angles for long periods of time. Wear protective clothing, such as eye protection, hearing protection, and gloves. Beware of blade binding. Check for misalignment or binding movement. If binding, then let go of the trigger and hold saw motionless. You’ll want to start off by reading the manufacturer’s instructions, as well as, collecting your protective gear. This includes protective eye wear, gloves, headphones, and shoes, if need be. Finish by double checking that the band saw is off or unplogged. First, you’ll want to determine what type of blade you’ll need. Band saw blades are called bands. They’re serrated metallic strips that are wrapped around pulleys. Blades vary based on thickness and bone density. By bone density, I mean the number of teeth or edges per inch. While they can be narrow or wide, some blades have fewer teeth than others. Fewer teeth mean lower bone density, as well as, a coarser cut. On the opposite side of the spectrum, more teeth means higher bone density with a finer cut. There are 3 common blade pitches (number of teeth per inch): coarse, medium, and fine. Coarser blades are better for thicker pieces, such as softwoods, plastic, and metal. Finer blades are better for brittle materials or hardwoods. Also, there are 4 common tooth shapes: Regular, skip, hook, and variable. It’s helpful to choose a blade that needs between 6 and 12 teeth to perform. You’ll want to adjust the saw’s blade tension according to the manufacturer’s directions. It should be a tension adjustment screw in the upper rear part of the band saw. Attach your blade and tighten it enough that it would slip while cutting. The blade tension shouldn’t be high when the saw’s inactive. So, you’ll need to tighten it to the right level. If your band saw has a movable blade guard, you’ll want to adjust it for cutting. You’ll want it to be close to the wood, but to have enough space that it won’t bind. ¼ inches is a good amount of distance. Try to set it at the thickest section of the stock. You’ll want to adjust the blade guides so that it’s close to the blade. This will keep the blade level and in place. Go ahead and put on our protective gear. Then turn the band saw on. When the saw’s running, you can just align the piece of stock with the starting line. When you’re finished, make sure that the saw is turned off, unplugged, and clean. When you’re purchasing a band saw, you’ll want to look out for a few key features. Here’s a quick list of tips that’ll make purchasing a band saw a quick and simple process. What type of material is used to craft the band saw? You’ll want high-quality, sturdy metals, like cast iron, steel, and aluminum. Make sure that you check the materials for the entire band saw, which includes the wheels, table, rip fence, etc. Look at the frame. A band saws frame is the support beam for the tool. It’s what holds the band saw together. The 2 of the most common types of frames are steel and cast iron. Steel Frame: these frames are very popular among the European market. Crafted from heavy steel plates, they’re typically very durable and expansive. Steel frames are available in sizes that range from 12 inches to 14 inches. Cast Iron: these frames have existed for generations. They’re composed of 2 thick machined castings and are typically available in a 14-inch design with 1 to 1 ½ HP motors. They are a great option for everyday operation. Most band saw’s internal wheels are composed of cast iron or aluminum. While aluminum is lighter and promotes faster cutting speeds, cast iron’s a good option for the extra inertia. This, in turn, provides steady speeds, as well as, stable, more controlled, results. Make sure that the band saw you choose can connect with your shop vacuum. Dust and wood chip buildup can easily cause fires or malfunctions. So, if you don’t have a shop vacuum, I suggest buying that, as well. Now that you know all about band saws, you should have an easier time choosing and purchasing one for yourself. Of course, it’s important to choose a band saw based on your own personal needs. Professional woodworkers should look towards more sturdier and powerful products. These can be more expensive, so you should look out for product warranties or refunds. A casual carpenter or DIY-er can pass up a bench top band saw in favor of a portable one. These are typically much cheaper and smaller, but significantly less powerful. In the end, it depends on rather or not you’re planning on working on large or smaller projects. Hopefully, you’ve enjoyed our review of the best band saw for woodworking. If you have any questions, I encourage you to comment or leave a review. Have you purchased any of these products before? If so, which one and how did it perform? Would you purchase it again? Why or why not? Which do you think is the best band saw of 2019?